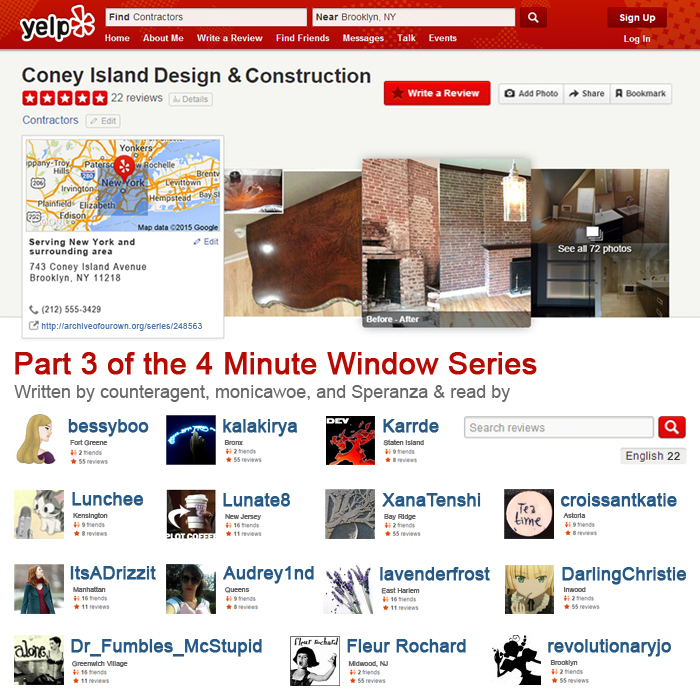 Summary: "The Yelp page for Coney Island Design and Construction has many positive reviews." Summary: Sam moves into Stark Tower and meets Steve's team-mates. Producer's Notes: Another CONvergence, another gathering of podficcers! There was no Mark Time Broadcast Center this year, so we made do with bessyboo's hotel room. Some technical difficulties resulted during the recording, but it was too fun a story and experience not to edit and release the final work. So many thanks to all the folks who participated -- everyone was awesome and I had a blast! Additional thanks to RevolutionaryJo, who beta'd my attempts to wrestle with these challenging audio files. Content Notes: Spoilers for Parade Day. Mentions of kidnap and torture. Big thanks to revolutionaryjo for the great feedback and quick turnaround time so that I could post this before it potentially becomes canon fodder at the beginning of next month. Title: This Has Been: "A Stupid Thought I Had to Share with All of You"
Summary: In which the folks from Greendale are in the Kickpuncher fandom and it causes about as much trouble as you'd expect. 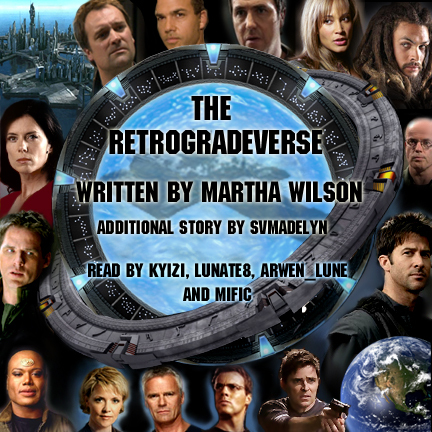 Compiled by: mific with the permission of all the podfic readers and cover artists. Thanks to everyone for that! Compilation cover by Mific. Each chapter has the original cover art - or very close - I tweaked the covers a little, mostly to increase the font size to make the titles and reader/author info a little clearer. There are another five stand-alone stories set in this verse. Not all have as yet been podficced, so there's a project for another day. A phone rang. Finch stilled, head tilted, listening. The pay phone was housed on top of a low grey metal stand in front of the corner deli. Instinctively, Reese glanced up and saw the red glowing eye of the camera. Finch had already started for the phone, but Reese put a hand on his shoulder. "It's for me," Reese said. Summary: A thunderstorm and a messy head of hair. Summary: Eames stares at the man across the street, sheltering under the awning and glaring at the sheets of rain splashing down. Notes: Another attempt at "extreme podficcing", this time using my iPod touch and recording outside. Take that, rain! :) You can hear my audio notes about recording it here, or download the podfic and notes together (mp3, 1.9 MB). Thanks to revolutionaryjo for the beta! Summary: Mortals and succubi. It only ever ends in tears, and recriminations in the Underworld about who drained whose soul first. Notes: This was my submission for chromatic_podfic. Summary: "221 Baker Street," someone mumbles, and John's honestly not sure whether it's him or Sherlock. This fills my podfic_bingo square of "Wild Card - Record in a New Location" (and how!). Summary: It's as if he's got a loaded gun lying about. Notes: Many thanks to aphelant for beta-ing, and especially to revolutionaryjo and darkemeralds for collaborating with me. Their awesome performances added so much to this challenging audiofic -- I couldn't have done it without them! This fills my podfic_bingo square of "More Articulation (for you)". Summary: Alec Hardison, if pressed, would probably suggest that he subscribes to a post-modern definition of identity. Notes: This is my (really late) submission for multipodicity (thanks for your patience, paraka and bessyboo! ), and fills my podfic_bingo square of "Repod a Podfic". The original podfic by bessyboo can be found here. opalsong - This Has Been: "A Stupid Thought I Had to Share with All of You"